Donald Trump’s recent resistance to cutting ties with his personal businesses suggests that he is unconcerned by the appearance that he may benefit financially from being president of the United States. His appeal as a billionaire, and his ability to use his wealth as an asset with voters of vastly different economic means, helps explain his lack of concern. How did Donald Trump, a billionaire who lives in a Manhattan penthouse full of golden furniture and travels by private jet to his Mar-a-Lago mansion, manage to connect with vast swaths of the U.S. electorate? One key to understanding Trump’s allure is his experience in the wildly popular financial self-help circuit. As a book author and a well-paid speaker, Trump learned a thing or two about the “common folk” who aspire to financial freedom and who revere the rich people who are “out of the rat race.” It was in this world that Trump perfected his charismatic performance in front of live audiences who were unhappy with their financial lives and sought change. Two of Trump’s books were coauthored with Robert Kiyosaki, author of the best-selling Rich Dad Poor Dad. For my recently published book, I studied fans of financial self-help, people who read Kiyosaki’s books on how to become rich and try to put the advice into practice. I attended their meetings, played a financial board game with them called Cashflow, and interviewed them. Kiyosaki became very successful by telling people that they should become investors who earn “passive income” that does not require their work. According to him, you just have to change from within and develop a different kind of smarts. Fans of financial self-help are told that financial success should not be the result of studying and working hard at a job, but instead can be based on profiting from the work and time of others and on having “money work for you.” People who don’t do this can only fault themselves. External factors such as globalization, structural inequalities, and the labor market should not be blamed for people’s fear of taking risks. In his campaign, Trump mobilized voters’ discontent with the economy, surgically avoiding questioning the role of the rich in furthering income inequality. This is a prevalent theme of financial self-help. The rich, including those selling books and seminars to those who aspire to wealth, are seen as deserving because they are financially intelligent and know how to recognize opportunities. In their first debate, Hillary Clinton attacked Trump for not having paid income tax in years. Trump interrupted Clinton’s accusation not by denying it, but rather by stating that avoiding income tax made him smart. While many were outraged, this kind of talk is common in financial self-help circles: the rich benefit from tax loopholes because they are financially intelligent. Even before the debate, Kiyosaki wrote that he hoped Trump had paid zero income tax. Trump’s comfortable admission shows us something about him and about the language of financial self-help he cultivated over the years. Financial self-help readers admire the rich and are not bothered by guru authors who profit from them, because that success shows that the gurus walk their talk and are truly smart. Readers do not find it troubling that a major part of authors’ income comes from fans, or that stories in financial bestsellers are likely made up, as long as the advice “works” for them. In their book Why We Want You to Be Rich, Trump and Kiyosaki argued that since they were already rich, they had no need to make more money, all the while cashing in on the very books that said so. Fans responded to these kinds of contradiction by praising both the authors’ earlier financial success and their shrewdness in taking advantage of the new opportunity to sell. Similarly, Trump operates on the notion that being already rich protects him from “special interests.” But he also campaigned on his alleged deal-making abilities, which include his own deals, as long as his actions and message still “work” for those who support him. Conflicts of interest are far from new in American politics, but the dimension of the problem for the president-elect and his dismissal of its seriousness are new. Never before has a president had ongoing stakes in businesses around the world on such a scale. Americans need to be vigilant of the president-elect’s conflicts and do everything possible to protect democracy, but to do so successfully we must also understand why many Americans tolerate and even admire Trump’s behavior. Trump learned as a financial self-help author that, to many people, his multiple conflicts of interest barely matter. If his daughter advertises the bracelet she wore in a 60 Minutes interview, this is merely proof of the Trump family business acumen, precisely one of the reasons for which he was elected. Trump’s dismissive reaction toward these concerns is rooted in how he appealed to his audience as a star in the financial self-help world. Trump’s personality and dubious ethics have been the center of attention for good reason, but so far have not hurt him electorally. Therefore, we should also examine larger cultural representations at play. The widespread impression in the United States that having achieved wealth is a reflection of a certain kind of “smarts,” regardless of its ethical implications for the common good, has served Trump well but is simply wrong. Daniel Fridman is an assistant professor in the Department of Sociology and the Teresa Lozano Long Institute of Latin American Studies at The University of Texas at Austin. 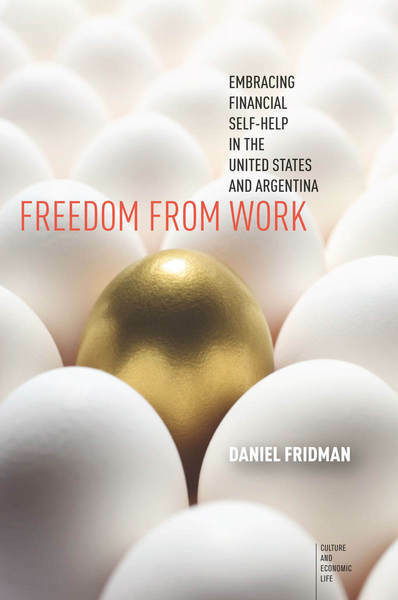 He is the author of Freedom from Work: Embracing Financial Self-Help in the United States and Argentina (Stanford University Press). A version of this article was published by The Dallas Morning News and The Austin American-Statesman. Good point! This is not anymore the kind of president that created jobs in his/her previous companies. It is the one that will liberate Us all with tips and a complete philosophy yo build up our own financial Freedom!